I like the smell of paper and the feel of paper. Though, I'm not so keen on the clutter that comes with paper. It was all because I believed there was a better way to keep up with my Christmas gifts & cards that I came up with a Christmas folder to corral all of the Christmas paperwork. 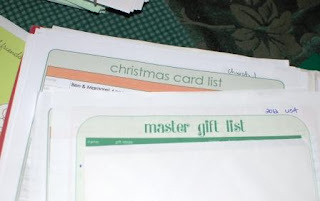 Master gift list - I keep a master gift list since I buy gifts all year round. Many times I will buy multiples of gifts if they are interesting items at great prices. Since I don't want to give someone the same thing I gave them last year, I keep a log of what I have given in years past so I can easily see to whom what was given. 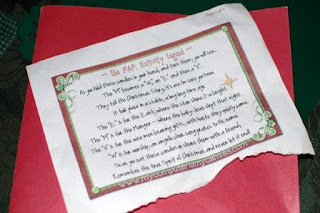 Thank you note list - As we get presents, I write them down and can check off their names as the thank you notes are sent. 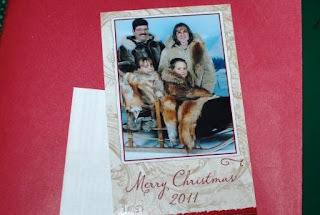 Exceptional cards - For the past three years, we have received a card from a non-existent family along with an outrageous newsletter. We have no idea which of our friends send this to us each year. The return address and postmark change from year to year as does the family in the picture. We now look forward to "The Bergstroms'" Christmas card. They are always hilarious and I have the last two in the folder. Christmas recipes and magazine clippings - I pull ideas for gifts, recipes, or decorations from magazines and put them in the folder. Last week, I mentioned some organization tips for the Christmas stuff and said that I keep it all put together in one spot in the attic. This folder is the one item that does not get put away with the other Christmas accoutrements. It stays in a drawer with my address book so that I can start my Christmas prep before I bring everything down from the attic. This is Day 18 of the Bloggy Moms Blog Dare. I love paper, too! I have a 3-subject note book with pockets (to stash receipts). One section for Christmas card mailing lists, one for gifts purchased, and one for holiday menu planning.